Tribal Council came alive on Night 23 of the game, as castaways were trying to navigate their next move amid broken trust and dysfunctional alliances. Whispers broke out and then it didn't take long for players to leave their seats and chat with tribe members on opposing sides. "I can never sense when a Tribal is going to become 'live.' It typically happens in an instant. In this case I think a lot of factors were in play," Probst explained to Entertainment Weekly. Julie Rosenberg appeared to kick off the chaos by crying over her position in the game. "Julie was wearing down emotionally, mostly because she doesn't like lying to others and she certainly doesn't like others lying to her. And I think it's pretty clear that she was the accelerant for Tribal taking a turn," Probst said. "But everybody is exhausted. So why her and not someone else? Let's dig a little deeper, and I hope that what I'm about to write does not offend anyone. I hope my armchair psychological assessment is taken at face value because I only mean it as a way to contrast personality types." Probst then went on to contrast Julie and Aurora McCreary's personality types and backgrounds, which allegedly contributed to Aurora's calm and collected state at Tribal Council. "Julie is a wife and a mom with kids. She is missing them. She is exhausted and wears her emotions on her sleeve. So she is not as stable as she was on Day 1. This isn't a surprise to the other players, nor to Julie," Probst said. "It's just part of her makeup. Aurora, on the other hand, comes from a very different world. She comes from the foster care system. She has been on her own most of her life." Probst continued of Aurora, "She is a very strong woman who by necessity has learned to rely on herself to get through most things in life. As a result, her emotions are not as easily visible because she can't allow them to be. Nothing is going to break her." Aurora and Julie therefore handled the potential of being betrayed by former original Kama-tribe allies differently. "A blindside that betrays Aurora is simply more information she can use to determine who to trust and who not to trust. But a blindside that betrays Julie is received differently and can be the tipping point that ignites a major turning point in her gameplay," Probst told EW. "That's why Tribal is so unpredictable. It's not apples for apples. And once Tribal turns, watch out. It's crisis time, and now everybody is on high alert. You saw it unfold the same way I did: one player at a time." While Julie was crying about deceit and lies within the tribe, Kelley Wentworth was shown whispering to Julia Carter whether they were still "good" on voting out David Wright, but Julia was secretly conspiring to take out Kelley. Julia, however, assured Kelley twice, "We're good." "Then [Rick Devens] reads into that statement and sees an opportunity to push the story in a new direction," Probst pointed out, referencing Rick's attempt to prove that Kama allies couldn't trust each other. "Now here comes Aurora with her more measured approach trying to stabilize the conversation and stop the bleeding. But Devens, David and [Dan "The Wardog" DaSilva] jump on it." Rick pitched the idea of seven tribe members coming together, despite their differences and former tribal lines, to take out one of the younger Kama players who seemed to be a package deal. Rick was hoping the five former Lesu members -- David, Kelley, Lauren O'Connell, Wardog, and himself -- would team up with the two Kama members who felt left out of the previous Eric Hafemann vote, Julie and Ron Clark. Rick's plan would leave Julia, Gavin Whitson, Victoria Baamonde, or Aurora vulnerable as potential targets for the night. "Now Julia senses the story starting to slip away and she does her best to squelch it by laughing at the entire notion. 'You're such a passenger, Rick,'" Probst recalled. In response to Julia's dig, Rick argued he actually had the GPS. "Every player has their own approach to the game, and that approach traces back to how they behave in life and especially in crisis," Probst continued. "And the reason a situation like this becomes so dangerous is that the moment any desperate player can create real uncertainty... there are other smart players who will use that uncertainty to create more opportunity." Suddenly, whispers broke out and Julie quietly told Wardog that she'd work with him. Julie then announced to the group Rick's plan sounded great, prompting Wardog to whisper Aurora's name as an option for the vote to Ron. Kelley was then shown whispering to Aurora, before David and Rick were called over by Ron to chat. "By this point Tribal was off and running, and Julie was drowning in a growing ocean of uncertainty," Probst told EW. 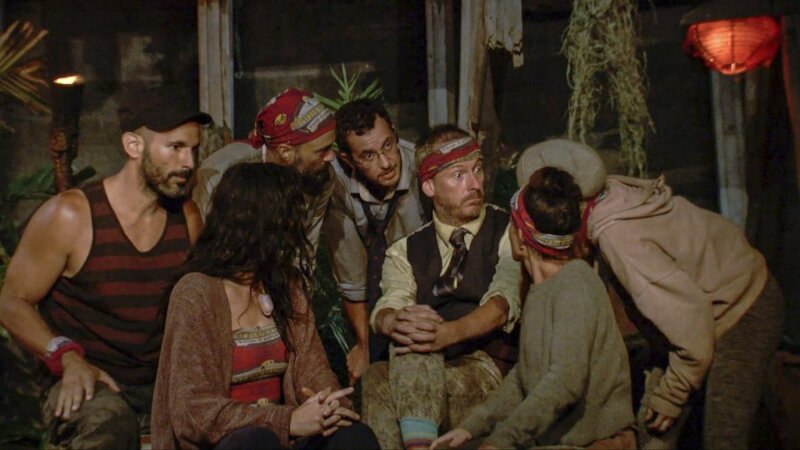 "It was a master class in very good Survivor players seizing a moment to ensure that this tribal became very live, because they knew that within the chaos there was opportunity." Although Kelley was initially hoping to work with Julia and her allies, she then jumped ship as well and agreed to work with David, Rick and the four other people onboard with this new plan to take out someone like Julia or Aurora. After all the chaos ensued, Julia was voted out of her Vata tribe through a 9-1-1 vote in which Kelley and David each received one vote. "I've watched that Tribal a few times, and I find something new every time. It's like watching a social car crash in slow motion," Probst admitted. "You see every step as it unfolds, but you can't really pinpoint which moment was the one that sealed the deal." Probst, however, apparently gives Julie the credit for what had transpired. "I would guess that ultimately Julie had the say because the Lesu group knew she was the most emotional and the owner of the 'live Tribal,' and in a case like that you just want to go with momentum and get to the vote as fast as you can." Probst said. "As for Julia as a player, I think she was probably seen as a very big threat. She's a very smart person with a sharp tongue, and that's a dangerous combo. She can tie you up in circles if you get into an argument." And Julia's sharp tongue appeared to offend and anger Rick as well as Wardog, whom Julia once demanded to "shut up" during the Tribal Council. (Wardog initially wanted Aurora gone but then changed his mind). "If that same sharp tongue angers the wrong person and Tribal goes live, you could be the one whose torch is snuffed," Probst reasoned. And that's exactly what happened, as Julia became the ninth person voted out of Survivor: Edge of Extinction and the sixth member of this season's jury. Julia, however, decided to stay in the game and wait for an opportunity to possibly play again for the $1 million grand prize by traveling to the Edge of Extinction. "Tribal Council was a mess. I have no idea what happened with the vote, and now I'm this close to really being out of the game," Julia said following her vote-off. "So, I'm definitely going to have to fall back on my will and my motivation and that will be a true test of whether or not I'm willing to push myself to stay in it."